As alluded to in the recent blog post on adidas goalkeeper shirt designs, the Republic of Ireland first officially wore kits by the German maker in 1986 – however, it wasn’t the first time that the famous trefoil had actually graced their kits. If you asked a sample audience of those relatively familiar with the country’s kit history what the rarest outfit is, chances are the strip worn against Norway in 1985 will be the consensus. It has competition, though. While nowadays, the thought of an Ireland game away to France conjures one particular image, trips to Paris in the mists of time have been responsible for two notable kit oddities. Recently, we came across this picture, from a World Cup qualifier from 1976. It’s not immediately apparent, but a closer examination shows that, while the shirts and socks were the usual O’Neills issue, the shorts – green, rather than usual white, were made by adidas. @okmick @irish_pics Very interesting! Informed of a shorts clash in Paris maybe and bought a set there? Given that France never wore green shorts, I think we have to take it “We had to borrow shorts off the French” to mean that the FFF sourced them from adidas rather than having them to hand. I believe it’s from Paris 1976. 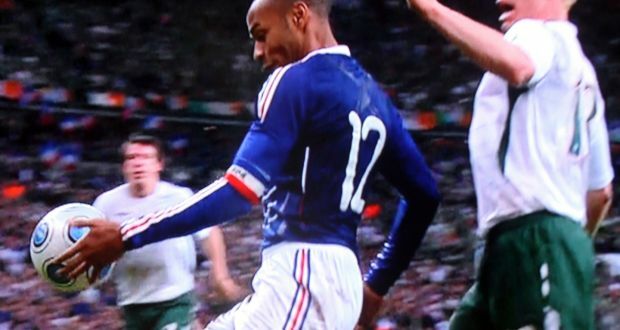 The FAI forgot to bring an away kit (ie white one) and of course the French refused to change theirs. However both teams shorts were white and there was an arrangement that the French FA would comandeer a load of green shorts to prevent any colour clash. Trouble was that they were made by adidas. Still beats the fiasco from the game in 1973 at the same venue. Legend has it that the FAI forgot the kit altogether and that the French provided an all green kit courtesy of, once again, Adidas. That was why we wore an adidas green kit with no badge for the occasion. Now, if you’re not a kit-nerd, it’s hard to explain the frisson of excitement that came from reading the last two lines. It seemed too good to be true, but then YouTube came good. It’s hard to fully see, but it is indeed the case that Ireland are wearing an all-green adidas kit, devoid of any other markings (as an aside, French away kits with white shirts, blue shorts and red socks were the best). Fairly nondescript and so very easy to replicate, in turn meaning you couldn’t be sure it was the real thing – surely the rarest of them all? Well it certainly should make us less high and mighty about providing kits to newly established Eastern bloc countries in the early 90s! I recall Lithuania had a plain white Adidas shirt with green trim when they played us at Lansdowne. USA 94 qualifiers perhaps?